Seattle home prices hit a record high this year and are rising faster than anywhere else in the country. The city’s thriving tech industry is fueling job growth and demand for homes. It also has become an attractive destination for wealthy Chinese. “We do not see any slowdown at all, even during the holiday season. Buyers are going crazy,” said Mei Yang, a Seattle-based broker at Realogics Sotheby’s International Realty who specializes in serving Chinese clients. 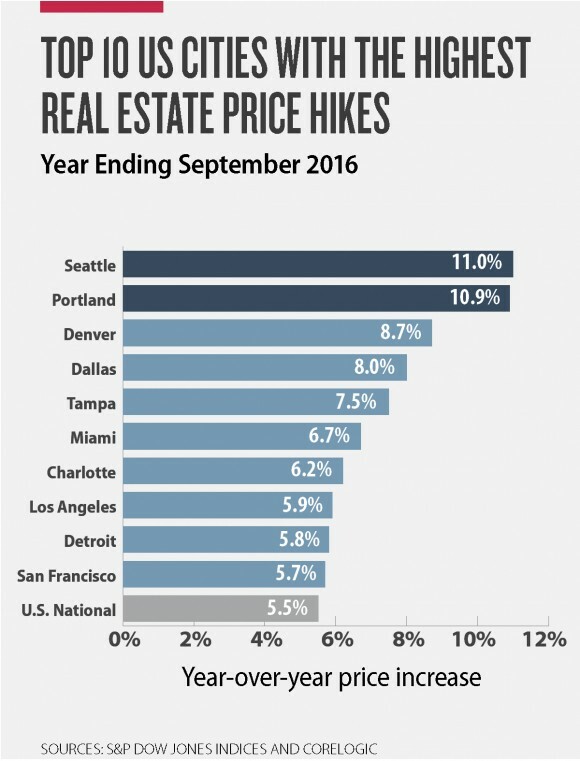 Home prices in Seattle rose 11 percent year-over-year through September 2016, according to the S&P Case-Shiller national home price index. Portland followed Seattle with a 10.9 percent increase in home prices during the same period. Seattle’s booming technology industry is responsible for record population growth. In addition to homegrown companies such as Amazon, Microsoft, Starbucks, and Boeing, many Silicon Valley firms have offices in Seattle. However, the rate of housing construction continues to fall behind the population growth in the city, leading to rising prices. “The supply is very limited and the demand for houses continues to increase as the major corporations and research institutes grow in the Seattle area,” said Peter Orser, director at the Runstad Center for Real Estate Studies. Facebook, Salesforce, Google, and eBay are among the tech companies that expanded their operations in Seattle. Facebook, for example, just doubled its operations by adding another 384,000 square feet of office space. “The quality of life is great, and office space and housing are very affordable relative to San Francisco,” Orser said. The number of technology workers in Seattle increased by 21 percent between 2014 and 2015, according to Redfin, a residential real estate company based in Seattle. 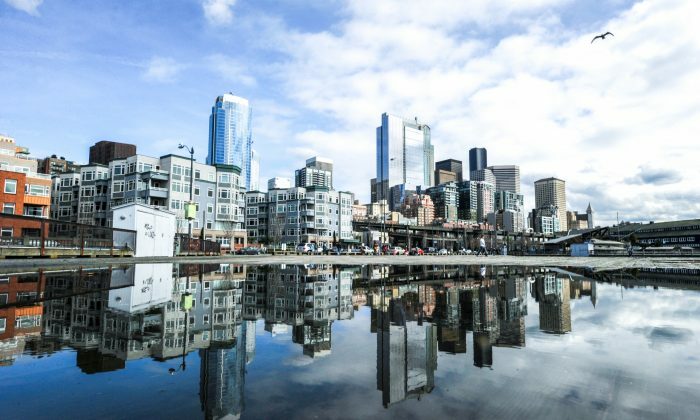 For every 1 percent increase in the population of technology workers in Seattle, home prices rise by half a percent, Redfin stated in a report. “I am still bullish on 2017 because the fundamentals are in place. Good high paying jobs are being created at a rapid pace,” Orser said. In addition to rising demand from tech firms, Chinese investors have become more interested in Seattle as well. And a new tax on foreign buyers in close by Vancouver is expected to support this trend, moving Chinese investors south of the Canadian border. Vancouver started taxing foreign buyers on Aug. 2. An additional property-transfer tax of 15 percent is applied to foreign nationals and corporates to reduce the pressure on Vancouver’s overheated housing market. With the increase in foreign demand in the past few years, the benchmark price for a single-family home exceeded CA$1.5 million ($1.1 million) in Vancouver. Compared to Vancouver, Seattle’s $612,400 median home price looks very cheap. With the 15 percent tax in Vancouver, Chinese buyers now prefer to invest in Seattle instead. “On the West Coast, among all the major cities, Seattle is still one of the most affordable cities,” said Yang. “It is a good way for [Chinese investors] to diversify their assets because the real estate market in China is cooling off, and the Chinese currency is being devalued. So the Chinese buyers are in a hurry to invest in the U.S. real estate market,” she said. According to Yang, Portland has a similar dynamic. “Portland, which is very close to Seattle, is also a very beautiful city to live in. … The house prices are a bit lower in Portland, so there’s more room for price appreciation there. But I don’t think the demand from Chinese buyers is as strong as in Seattle,” she said. One of the reasons why Chinese people are so attracted to Seattle is its portrayal in the 2013 film “Beijing Meets Seattle” (also known as “Finding Mr. Right”), a romantic comedy that became a box office hit in China. The movie beautifully portrays Seattle, but ironically it was filmed almost entirely in Vancouver. “One day, I got a call from a Chinese man from the Seattle airport. He said he and his wife had just arrived at the airport, and they were considering buying a house. His wife was pregnant, just like in the movie. It was so funny this young couple decided to visit Seattle after watching that movie,” Yang said. Seattle now attracts many Chinese tourists and real estate buyers as a direct result of the film, according to Yang. There are some Chinese buyers who don’t even visit Seattle. They check the real estate listings on WeChat, a Chinese instant messaging application, then just buy a house. “I promote my listings and real estate properties on WeChat. In fact, this year I sold three houses via WeChat,” said Yang. “One of the buyers has never even seen the condo in person, so everything was communicated electronically,” she said. Nonstop flights between China and Seattle have increased in recent years. Seattle’s clean air and water are much different from what’s found in many places in China. There is no state income tax, and the low property taxes are attractive for real estate buyers.